Infringement of trademarks in Ads is common place. It is very frustrating when someone else includes your trademark in their ad on Google, Facebook, or LinkedIn. They are essentially using the goodwill you have built up in your brand to sell their own goods or services, and in the process take business away from you. There is a recent classic example that ended up in the Supreme Court of Appeal in South Africa. 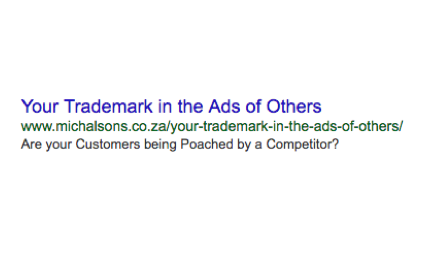 Sometimes you do a google search for your trademark (or website or brand name) and you see that someone is not only bidding on a keyword that includes your trademark, but they have included the trademark in the copy of their Google Ad. This could mean that a user searching in Google for your company, may end up on a competitors website. Consumers may get confused. Is this legal? Is the person allowed to do this? Can you complain to Google? What legal action can I take? Can I bid on someone else’s trademark? Is it unlawful competition? Is it passing off? How we can help with Trademarks in Ads? We can stop someone else using your trademark in their Ad, be it a Google Ad, Facebook Ad, or LinkedIn Ad. We can also help you to defend yourself.